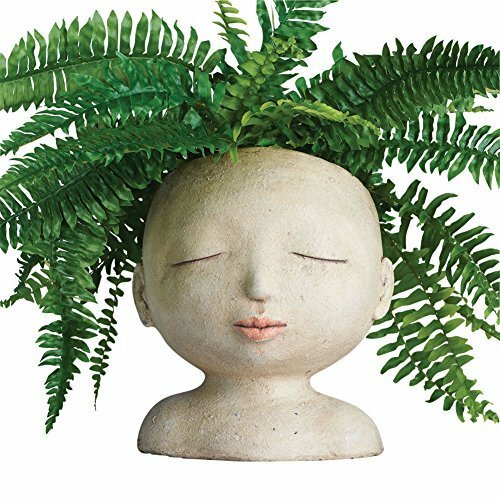 MAKE YOUR PLANTS MORE FUN - Head-of-a-Lady pot is a sure way to spice up your indoor or outdoor plant display. HOLDS BOTH SOIL AND POTS - Empty top easily fits soil or small plastic pots. PLAY HAIRDRESSER WITH YOUR PLANTS - Give this lady any hairdo you want - bouncy ferns spiky aloe or flowing ivy. LIGHTWEIGHT AND DURABLE - Made of strong resin compound that will survive bumps and falls. Please note: these are individually painted and slight imperfections or differences should be expected. If you have any questions about this product by ART & ARTIFACT, contact us by completing and submitting the form below. If you are looking for a specif part number, please include it with your message.